Whether you’re sending your first child off to college – or your sixth, drop-off day is a bittersweet experience. 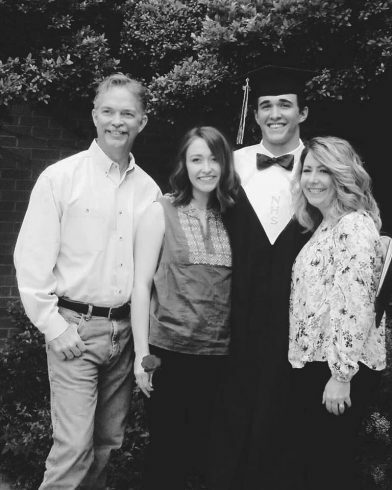 We’ve gathered a collection of thoughts of Wildcat parents whose students will join the ACU family next week. We’d love to hear your thoughts, too! Below, M.C. and Shane Jennings reflect on sending their second student to ACU. The Jennings family (from left): Shane (’89), Morgan (’17), Zach and M.C. (Hayes ’91). The difference in having a boy moving into the dorm vs. a girl moving into the dorm? We bought everything he needs in less than two hours. I am very excited and feel incredibly blessed to be sending my son, Zach, to ACU this fall. ACU is a place, like every university, where students will face all kinds of challenges, and they will have opportunities to learn how to deal with and overcome those challenges on their own. It has been a huge blessing to watch my daughter, Morgan, a senior, grow and mature in her years there so far. Her example of success makes the thought of seeing Zach move out of our home and into the dorm a lot more fun. I love my kids more than I could possibly put into words, and I cherish all the years that they have spent in our home so much. But, as sad as the thought of them moving out of our home can be, I know that it would be even more sad to watch them turn into adults who were unprepared to move out and successfully live their lives on their own. It gives me great comfort to know that they will spend a few transition years at a place like ACU, where they can grow and mature and find their wings and do all of that with a focus on the Lord. My prayer is that Morgan and Zach will grow closer to the Lord in every way during their years at ACU and that they will look for His purpose for them in all that they do, and also have the courage and wisdom to follow the Lord’s direction at ACU and beyond. I will shed a tear or two here and there, I’m sure. But I know that many of those tears will be tears of joy as I watch them continue to grow and mature and excel. May God bless all our children in that regard. It was so very hard to leave our oldest daughter, MC Jennings in Abilene and drive back to Houston without her. ACU has blessed our family in so many ways: with our sons-in-law Shane Jennings and Kenneth McKillip. This year all five of our grandchildren will be on campus: Madison McKillip, Morgan Jennings, Shelby McKillip and two freshmen Zach Jennings and Audrey McKillip. Wow what a blessing! Look out world these kids will be “movers & shakers” just like their parents – MC & Shane Jennings and Kenneth & Cherrie McKillip!